My second lesson of the day continued my veteran client’s current theme on stand-up to ground grappling. We have been looking at takedowns, finishing in submissions. Linking directly to last week’s class, we looked at submission counters to takedowns. The lesson warmed up with partner work. Stand-up grappling warm-up included collar/elbow tie up bulling, over-hook/under-hook pummelling, takedown entries, arm-drag drilling and arm-drag/takedown counter drilling, whereas ground grappling warm-up included pin transitioning, guard transitioning, submission and sweep drilling. We revised the arm-bar counter to the major outer reap takedown. Here we focused on correct hip switching and shielding the hip. The latter point brought us onto attacking with a heel hook from hook guard. Next we went back over the anaconda choke counter to the double leg takedown. Here we explored the use of the anaconda choke from a stand-up position for MMA and also in the familiar alligator roll format. 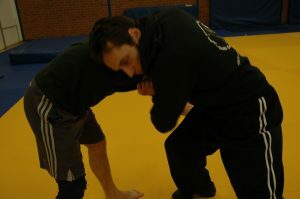 The lesson finished with grappling free-sparring, starting from stand up.